Always flattering when a company like Patagonia asks to use one of our images. 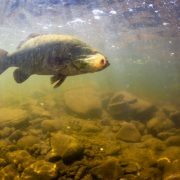 Low clear water and aggressive smallmouth bass, make for some fun images. Always appreciate the time that customers give me on days when I can get out of the boat. Special thanks to Jerome for letting me take a few minutes and capture a quick photo or two on your smallmouth adventure. 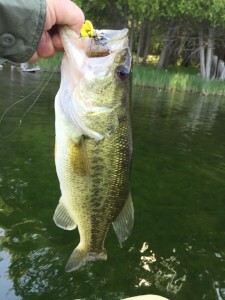 Smallmouth Bass fishing continues to be really good, with some big bass around this year. Make sure to follow along on the river reports page at Hawkins Outfitters for the Manistee River and Kevin Feenstra’s Muskegon River Report. Well, it’s that time of year again. I’ve inventoried my fly boxes and I am scrambling to fill my spring, summer & fall fly boxes for the upcoming seasons, as old man winter starts thinking about taking his nap, I hope! This winter has been full of tinkering with new materials and techniques for favorite fishing, steelhead on the swing. Per usual, I completely forgot to do what I always intend, which is to fill the holes in my boxes from a spring, summer and fall of fishing. Ugh, production tying. Not a fan. The most enjoyable part of tying for me is the development stage or learning of new patterns. When I sit down to let my mind wander and relax into it’s artistic side & start free styling, my default is steelhead streamers. The array of colors and materials that one could imagine using and attracting this quarry is astounding. So I play with color combos and styles of flies deep into the night while sipping on something brown. Bourbon, rye and scotch being the likely suspects. Sometimes the next day I awake with a headache, grab some coffee and go critique my flies from the night before. The bigger the headache, the more likely it’s “WTF was I thinking!” Sometimes I impress myself and sometimes the razor comes out & the hook is shorn of the monstrosity. 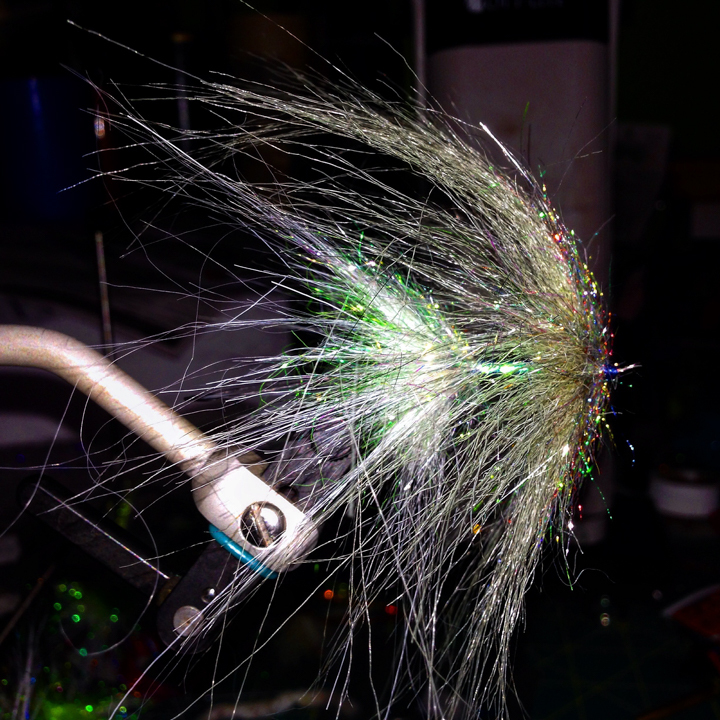 Which begets a question that I hinted to in the title- what are my beverages for tying flies? Sure, whiskey has turned my brain and fingers into madness & what transpired on the vice was abominable, but some nights it’s more about the drink than the tying. Then there are the nights that a neat dram of whiskey is the perfect accompaniment, as a sip every so often soothes my soul and the whiskey’s temperature does not change & some of the resulting flies have found permanent places in my boxes. So, here’s my guide to what to drink when tying flies. Yours may very as we all have preferences. #1 Drink coffee to keep you rolling and the mind free from the numbing effects of doing a dozens of the same pattern. 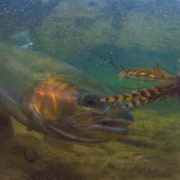 I know a few guides who really like tying production, as it gives them a “check out time” when they don’t have to think about what they are doing as they done the fly hundreds or thousands of times. Especially the dreaded egg patterns. #2 Drink water- no better time to hydrate. Until it catches up with you and you spend more time in the bathroom than at the vice. #3 Drink a low alcohol beer. Think macro brew or old world Pilsener. Pabst has been a fly tying staple for some for many years. Personally, I go with a craft “Session” beer. Short’s “Ale la Reverend” is my favorite when it’s available and Founders “All Day IPA” is good to go all year long and comes in 12 pack cans. Dry Flies/Nymphs- kind of falls in to the same category as above. They are not my strong point, so I stick to H2O. Sometimes red wine is a good option. It’s a sipper, doesn’t loose it’s temperature and gets better as the air mixes in and it “opens up”. Wet flies/Soft Hackles- tradition would call for a fine dram of Irish or Scotch as these patterns were originally from the British Isles. But be careful, as once you start working on the wet flies with tented or married wings, your fingers and mind need to be nimble. On the other hand, simple soft hackles like the Partridge and Red/Yellow/ Orange that work so well, can be done when a wee bit addled. The other traditional drink that I partake in if it’s summer and I am refilling the Wheatley box would be a tall Gin and Tonic. Nothing says summer like a G&T while tying wets/soft hackles! Traditional Steelhead and Atlantic Flies- Once again a glass of whiskey does well and for me, it has to be a Single Malt Scotch, likely from Speyside and even more likely it’s Mortlach 15yr or Macallan 10yr Fine Oak. I savor this traditional beverage slowly, maybe only taking a sip as I put the hook in the vice and when I take the finished fly out. I need all my wits about me when trying some of these complicated beauties. Streamers- Beer, beer and more beer! I love tying streamers and nothing goes better than beer. Likely something with a little kick, like a Stone IPA or a Ballast Point “Sculpin IPA”. Beer keeps my juices flowing and my thirst quenched. I tend to wet down and pull back materials on my streamers as they can get in the way of the next step. Usually all that is needed is a little saliva and beer aides in this process! Freestyle/Creative Session- Bourbon…on the rocks. When I’m messing around testing new ideas or materials, bourbon fuels the fire! It is also my go to spirit, period. When I am creating new flies, my concern is not for the immediate finished product, as it’s very rare that something comes off the vice and doesn’t get tweaked and refined. Most of the time it’s put somewhere on the desk where I look at it and critique the shape, size & proportions of materials. Then I tie it a second time with my improvements. Then I repeat this a third time. But I stop there until I can see them all on or in the water. Some patterns of mine have looked great until water tested and afterwards, straight into the garbage or under the razor. One last thought…when it comes time to clean up your tying area, as I know most of us let it go until we can’t stand it, I advise a strong cocktail to ease the pain! Maybe a Dark & Stormy, a Moscow Mule or a Manhattan. My desk is a mess right now and will be until I knock out all my spring & summer flies. Then it will get cleaned up and likely stay that way until after the summer, as I will be too busy fishing & not tying. Unless I blow through a certain pattern that is lighting them up, then it’s back to it and the dreaded production tying begins. Ugh, production tying…and you better bet there will be an adult beverage involved! Post by Snap T Pictures.